Jerry Yang (a new poker millionaire, not the Yahoo! billionaire) took it, with pocket eights against Tuan Lam‘s ace queen with all the money in pre-flop. After getting outflopped, he runner-runnered a two-gap gutshot straight for $8.25m. A true champion. A novelty side bet, that is. A bracelet… nah, he still hasn’t got one. Thanks to some dodgy geezer streaming the ESPN pay-per-view coverage on a dodgy web site, I’ve been able to watch some of the Main Event final table live. Although, I didn’t exactly sit and watch it intently because it’s just a little bit on the dull side. Of particular dullness are the incomprehensibly long delays where the dealer dutifully freezes (I think he’s also required to not breath) between dealing each round of cards when a player is all-in. They must have to take a moment to drag in a few more cameras, as it’s very important to make sure they can catch the reactions of all two players in the hand, get a fresh look at the prize money, and also see all five board cards as they sprint across almost half a yard of felt. How on earth does the ESPN crew cope with NFL games? When everyone’s ready the announcer says, "Here comes the turn card". Thanks for that. These guys have been playing this tournament for eight out of the past 12 days. Right now it’s level 32 ($150,000/$300,000 blinds with a $40,000 ante) so that’s about 64 hours, not counting breaks, in total so far. They all know what comes after the flop by now, even if they didn’t when they paid $10,000 to enter. The live audience may not have been paying such close attention as the players the past fortnight, but they turned up to watch the World’s Slowest Poker Game – it’s not like there’s nothing else to do in Vegas today - so they must have at least a passing interest in the game. I’m pretty sure they know that the last card dealt is called the river. The folks watching at home (some of them at least) paid $19.95 to have 16 hours of their life drained away, so they probably know a bit of the lingo too. Even if they didn’t, there’s still Phil Gordon and A. N. Sidekick saying pretty much the same thing as the announcer at pretty much the same time. And when it’s shown to the masses on ESPN proper in August, there’ll still be Norman Chad. (I can’t possibly even start to go there). So back to the victory. 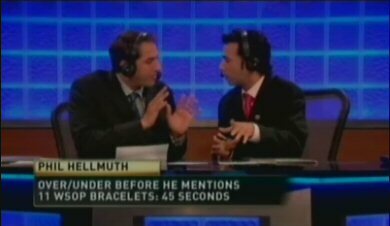 Phil Hellmuth was making his way to the commentary booth – which is actually a desk – and Gordon made a bet with Sidekick: how long before Hellmuth mentions his eleven bracelets? The line was set at 45 seconds, and Gordon took the under. 36 seconds. $100. Ship it. In just three weeks time I’ll be playing the first of four tournaments I plan to enter in the Orleans Open. Three no-limit Hold’em poker tournaments, and one fixed limit folly. My backers may be wondering what I’ve been doing in order to prepare for the fixed limit event. Raise raise cap call call call call call. Bet raise raise cap call call call call call. The sound of half a dozen players trying to bust out so they can start again in a different tournament that they actually want to play. But even after all that action, the losers still have 80% of their starting stack left. And so the pattern begins again. You never know, it might be just the same as this in a $540 festival tournament, but I doubt it. I’ve not really found anything lately, but I’m still on the lookout for some limit tournaments I could try online. I want to find a tournament with a decent sized field (I remember playing in a field of just seven on Empire a while back) and one where the players do actually want to be there, so I can get a feel for how the dynamics of the game change as the limits increase. In case I don’t find anything suitable in time though, I can always keep in mind the strategy employed by the youngest ever World Series of Poker bracelet winner, Steve Billirakis. He won Event #1, $5000 World Championship Mixed Hold’em event – which alternated between no-limit and fixed limit every 30 minutes – aged 21 years and 10 days. In this interview with Phil Gordon from the Expert Insight WSOP Podcast, Billirakis revealed (obviously I’m paraphrasing) that he is an arrogant rich kid who was desparate to get onto TV playing poker as soon as possible after his 21st birthday, without having – or thinking he might need to have – any idea how to actually play a game that made up 50% of this tournament. Sadly, he got very lucky. "I don’t have much experience playing limit Hold’em, so I pretty much avoided playing limit Hold’em"
Oh, if you still want a piece of my action, I only have 5% left for sale, and it’s going on eBay very shortly if I don’t shift it! Tony G does a brilliant job of demonstrating the blandness and complete lack of character at the Rio, by filming his video blog in a lovely taupe room where the World Series of Poker payouts are processed. Welcome to stupidly large World Series of Poker satellite night. On Poker Stars, 150 seats are guaranteed to be given away and on Full Tilt another 100. In fact, between the two sites there’s over $4 million dollars in play – enough for 359 ten thousand dollar seats, and a bit of pocket change to the runners up. I never even thought of playing one of these until today, yet here I am, battling with nearly 7000 others on Poker Stars in Probably The World’s Largest Satellite Poker Tournament Ever. OK, actually it was ever so slightly bigger last year, but not so much you’d notice. Turbo satellites are silly. With the blinds at $1500/$3000, plus a $150 ante, I have little more than one small blind remaining. Click on the thumbnail to see the full table image. For Harrington fans, does the fabric of the universe falls apart when you have an M that has to be expressed as a fraction? It all looks grim, and yet I’m loving it. Believe it or not, I’m in great shape here. This was an $80+$8 qualifier to the main satellite. The lobby called it a "last chance" tournament, but I will argue that it was actually my first and only chance. One in five got a seat, and it looked like a good way to use up my W$ balance, which has been doing pretty much nothing for as long as I can remember. Sure I could have sold them for 80% of value, but I figured eventually there’d be a more interesting way to spend them. This was going to be it. With 350 players remaining and 317 getting paid, I’d been fortunate enough to get two successive table breaks that landed me in a good seat, just as I was about to be blinded out. Game of skill my arse. Cards were irrelevant by that point. Almost nobody could survive one round of blinds, so all that mattered was hanging on longer than everybody else. With 38 tables left, 33 players left to be eliminated and the luxury of five free hands before I was forced in on the big blind, I needed 6 or 7 players to go bust for every hand played at my table. No problem. I was all set to fold pocket aces. Two hands later, you could probably hear my woohoos. I’d got a result in the turbo poker lottery, which from start to finish took just 75 minutes to eliminate 80% of the field. The main satellite will be somewhat slower, however. 30 minute levels and 6702 players to money. Could be a late one. I’ve never bought or traded a percentage in another player before, but now I have ten percent of David Buckle in next year’s WSOP Main Event. Not a big name player, I grant you, but it’s got to be better to walk away from a tournament with a lottery ticket than a big fat zero. So that’s what I did. Last night was the £150 WSOP super satellite at Gutshot that I won entry into last week. With 33 players and a handful of rebuys, the prize pool just topped the £6500 mark – just enough to award one Main Event seat with flights and accomodation. Somewhat top heavy. With one buy in less in the prize pool, we’d have been playing for three packages with a $1000 super-satellite at the Rio and some spare change for 4th place. Despite almost everyone in the tournament preferring to play for three places, the prize structure stood and we weren’t able to chop the package. The final add-on was actually taken by someone who wanted to play all-or-nothing for the big one, knowing that paying the extra £150 would be enough to create the seat. And that was that. So with twenty-something players remaining and just one prize greater than the price of a buy-in to play for, I wasn’t going to hang around. Looking down at AK and having a below average stack, I figure I have to take a shot, even facing a raise and a reraise that already covers my chips. I’m hoping to run against two smaller pairs, or one smaller pair and a worse ace. In either of those spots, I’m about one-in-three to triple up and that’s plenty good enough. In fact, I end up drawing a bit thinner, against QQ and KK. When the KK is slowrolled after seeing both the other hands, karma kicks in and sticks a queen on the flop right up his arse. There’s a jack too, so I’m calling for a ten to make a winning straight, and the turn card dutifully obliges. I should have tripled up here, but somehow I got stiffed on the pot. I moved in for 3200, but ended up with 7300. It should have been virtually 10k, but thanks to the excitement of actually still being in the tournament, I didn’t notice until half way through the next hand. All I can think is that my side pot was only awarded the first player’s original raise; whatever happened it was too late to do anything and I had to try to convince myself that it wasn’t going to matter that much. Actually, it was about as insignificant as you could hope for. From that point on, I only committed all my chips twice; once defending my blind with A2s (my reraise was called after an eternity by 35s, and I still don’t understand why but it made breathing difficult for a while) and then when I was actually eliminated in fourth place, with my AJ losing to K9. With four players remaining and the cardroom still unwilling to chop up the prize the best we could come up with was for the winner to give 10% of any World Series winings to each of the other three. We hastily scribbled an agreement which the club are keeping in their safe; far from perfect but even a forum post is more than anyone claiming to have a piece of this year’s winner had. Even though the deal really probably isn’t worth much (although, of course, it could be worth 10% of $12m…) it no longer felt like I’d been playing for six hours with still a chance of going home with nothing. I was pleased with my performance, and definitely got more out of this tournament than I expected. 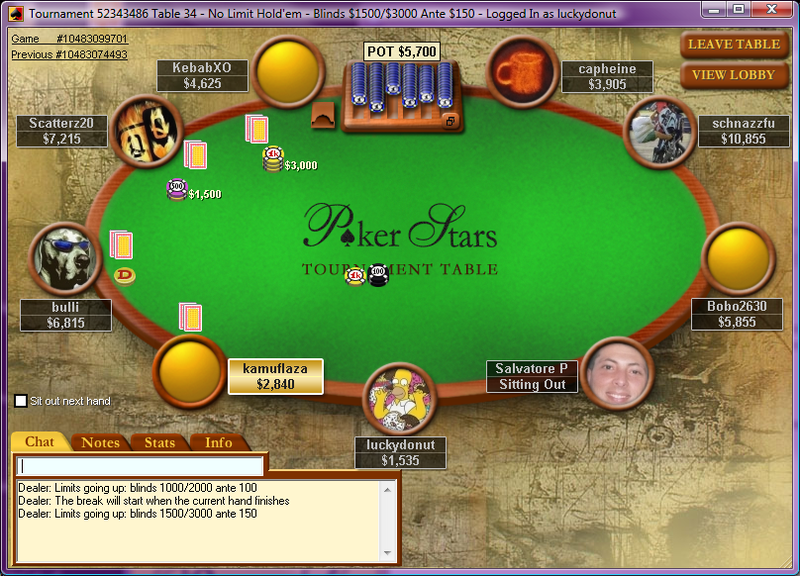 Most importantly, I got a lot of high-pressure final table experience. The stakes were way out of my comfort zone (my seat was worth over £1700 before I busted, and I couldn’t lock in any of that equity) but I didn’t choke. I stayed patient and made good decisions. I’d built a table image that I could take advantage of. I always believed it when I told myself I had as good a chance as any other player to take first place. I was also very pleased that I managed to walk directly back to my hotel without passing any places that I’d only ever seen on Monopoly squares! This is a first for me, and although it’s nice to see London by foot, it’s not ideal when you’re alone at 3am and are a little unsure of the way. Plus, I was disappointed last week when I discovered, by accident, that The Angel Islington was just another Wetherspoons. No WSOP for me. Already. The timing couldn’t be worse. Harrah’s have announced that the series will being on June 1st with the final table of the Main Event on July 17th. There’s no specific schedule information at this point in time, and I guess they don’t actually know when it will start yet because nobody can qualify online anymore. But still, there won’t be a poker table in sight at the World’s Most Vacuous Poker Room when we land on July 22nd for Summer O’ Poker III. I’m still undecided whether this time it will be in 3D.